As we careen towards the over-the-top-much-hype-release of Super Smash Bros. for the Wii U, the (sadly) simultaneous release of Pokemon Omega Ruby and Alpha Sapphire, plus the inevitable release of no doubt fantastic Hyrule Warriors DLC, I wouldn't blame anyone who shelves Bayonetta 2 (and the included re-release of the first) this month. With such an intense few weeks of fresh from the box gaming, we all know a gem from last month needs to be retired. 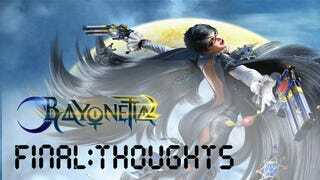 So let's stop and talk about the immaculate Bayonetta 2 now that most everyone has had a chance to play and beat the game. The gameplay is so on point that that I don't think it will be surpassed in a long while, but it was BRUTAL. I ended up playing on the easiest difficulty setting because I found myself getting frustrated as I progressed through the story, and never once did I get a 'Pure Platinum' score. That might just speak about my gaming skills over anything though. The over the top sequences left me smiling during each chapter of my own playthrough, and the fun that Platinum injected into it with it's Nintendo themed costumes added to the insanity. I'm glad they included the first game, because it made the characters who made a return much more meaningful, story-wise.